Oh my, H.P. Lovecraft in the style of Dr. Seuss ! That makes me soooo happy ! Most of the dev work has been over on the SM forum since it's being done as a Poser prop again. Don't forget to let me know of any problems you have with this, or any suggestions for improvement. I'm now considering doing a DS-native DUF version if I can resolve the DS integer slider problem. I'll be able to do 3Delight materials, but I don't use iRay - so if anybody does iRay mats for this please let me know. 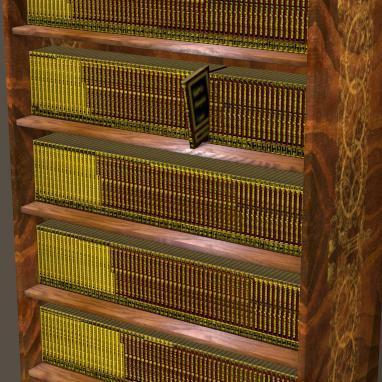 A single prop consisting of 384 books (six rows of 64 books) that can be fitted to most six-shelf bookcase. 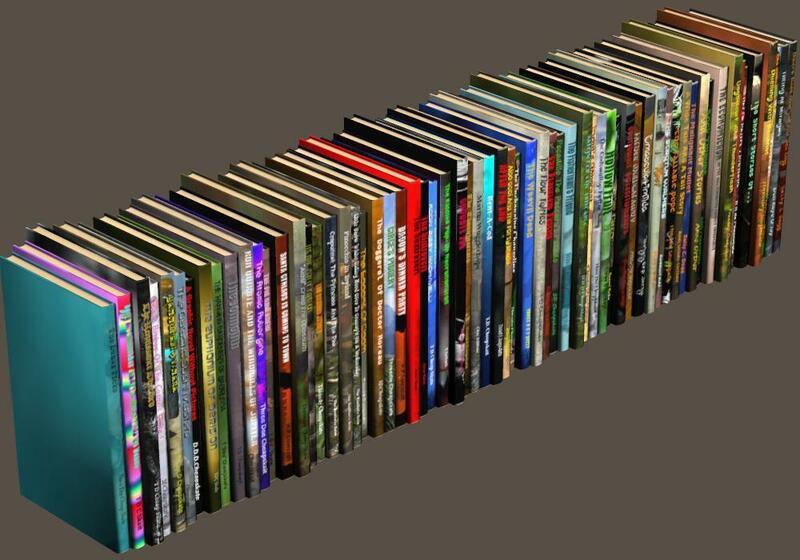 Includes morphs to give random-ish book sizes, and three alternative textures. Works in DAZ Studio too (and I'm working on a DS-native version). 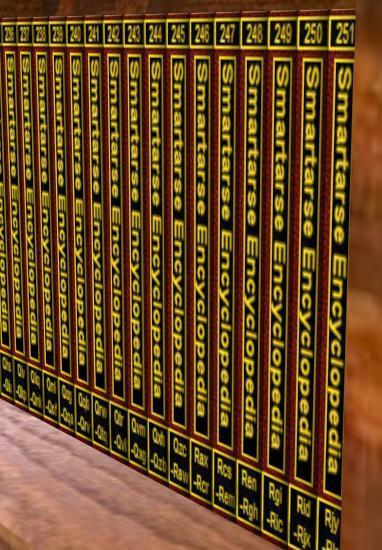 There's a magnet parented to it that can be used, via the controls under 'Individual Book', to tilt and pull out any one of the 384 books (unfortunately this bit doesn't work in DS3 :o( ). 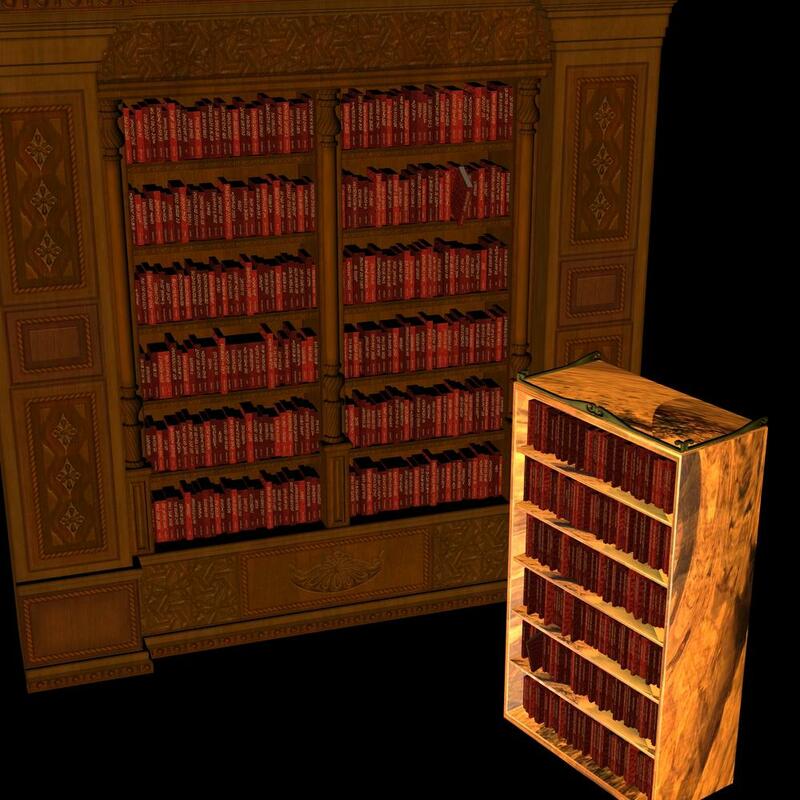 To use the prop with ANY six-shelf bookcase, first set the 'Close Gaps' under 'All Shelves' to 1. Then use the standard x/y/zTranslate, Scale, and xScale dials to fit the bottom bookrow to the bottom shelf. Next use the 'Adjust All' dial under 'All Shelves' to position the top bookrow on the top shelf. And finally, if necessary, use the individual 'Adjust' dials for shelves 2-5 to tweak those. There are two 'Quick Fit' dials for the two six-row bookcases I happen to have in my runtime. Simply parent the prop to the bookcase and set the appropriate dial to 1 - that's all ! 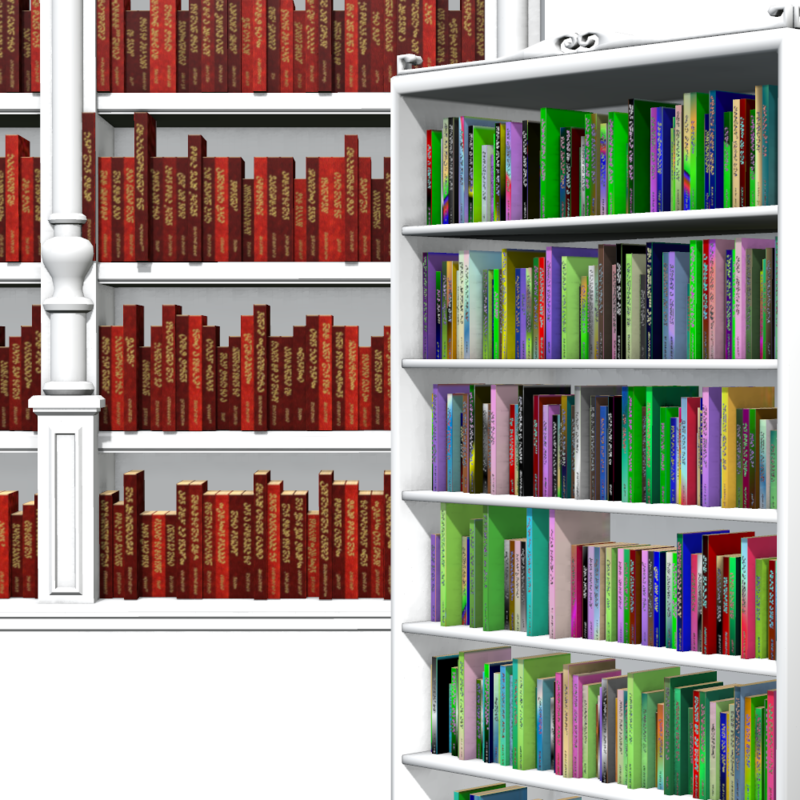 Of course, you may not want all the books the same size - simply use the 'Randomize All Books' under 'All Shelves' and/or the 'Adjust Odds/Evens' under the individual shelves. This is the second freebie from my book stuff project - . Seethe associated thread on the Smith Micro Poser forum for more information. 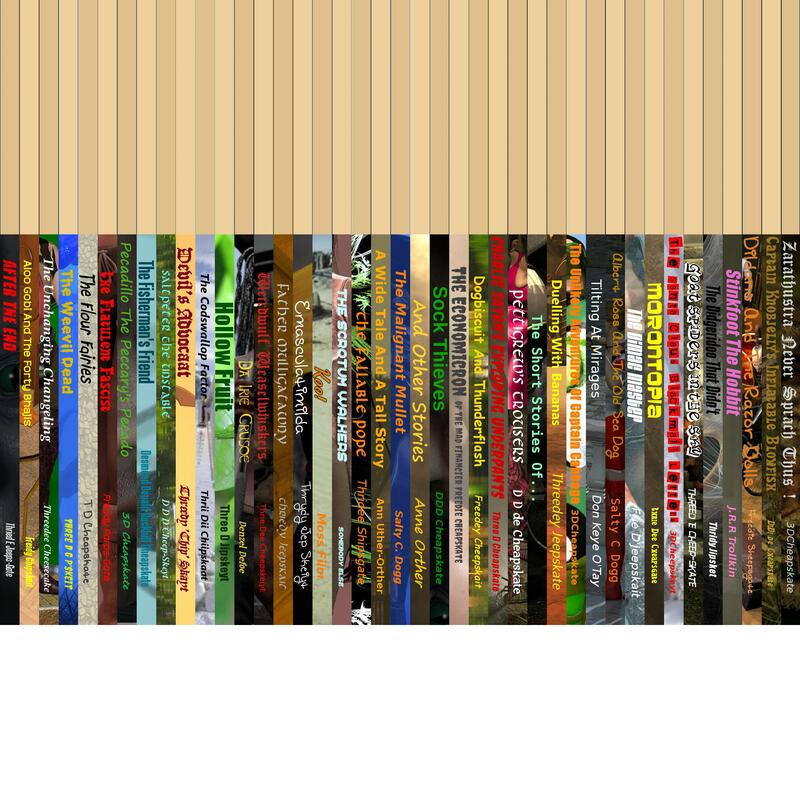 The second image is another texture map for the bookrows. Use the 'View Original' option on this ShareCG page, download the image (it's a 2048x2048 JPG), and apply it in the Poser Material Room. Known problems (see the readme for full details). 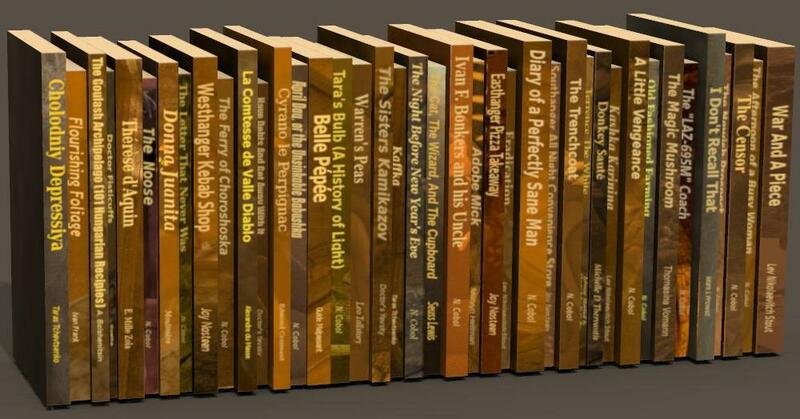 - In Poser 6 the selection of individual books doesn't work properly. - No DS materials, and the 'Quick Fit' and 'Shelf/Book Number' dials are not restricted to integer values and are displayed as percentages. - In DS3 the individual book selection doesn't work. Just noticed that the magnet (inc. base and zone) doesn't load in DS any more, so you can't select and pull out an individual book. <-- ignore that ,it's rubbish. I've just managed to do a DS-native version of this six-bookrows prop (a simple problem that went rather round the houses before it got resolved). If anybody's interested in it I might see if I can do DS materials. So is anybody interested ? I know that I for one am definitely interested in the prop.This has had quite the wonderful journey, and it looks so incredibly useful I am excited to use it. The materials are less of a concern since I use Iray and would have to convert them anyway. You mentioned before that you would be interested in an iray preset for these, correct? I'd be happy to share! As usual, one person interested is good enough to make it worthwhile. Not sure of timescales though - hopefully within the next week or two. I'll try including 3Delight materials too, as it seems a shame to skip that. It's been quite a while since I last did both Poser (Firefly) and DAZ Studio (3Delight) materials for something I'd made, but I recall that it wasn't too difficult - just a bit of a PITA remembering what I need to do, so I need to refresh my brain (I've got another thread regarding that). Regarding iRay (Or is it Iray? Or IRAY?? iRAY???) textures, yes indeed - and I've posted a request on the General Freebie Requests thread for that. Two people ! Now I'm contractually obliged to do a DS-native version ! The Poser props already work fine in DS4 with just the minor niggles noted in the readme as far as I'm aware (I've tested with DS4.8 and DS4.9 beta which are the latest I have). All you need to do is File > Import and select the Poser PP2 file from anywhere. 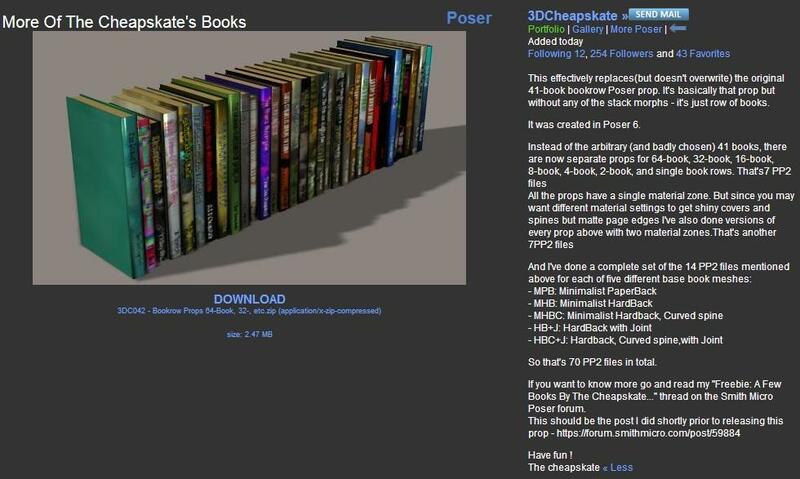 Or if you have Poser files in a Poser runtime (and every DAZ Studio user has at least one Poser Runtime whether they realize it or not - the 'Runtime' folder in every DAZ Studio Content Directory is a Poser Runtime, although you may not have any Poser format files in it). Use Edit > Preferences > Content > Content Diractory Manager and add any Poser Runtime that actually contains Poser content to the Poser Format section. So making a DS-native version is just making it a bit more user-friendly for DS users. Well, it looks like I'm not going to meet those timescales. Unfortunately I felt that I was going round in circles once again with the DS Glossiness problem and just got fed up. I'm now looking at the book stuff again, but a different part of it.If I can build up enough enthusiasm again I'll try and get the DS-native stuff to a state where I'm happy to upload it. Edit (11Dec2018): ...and... it would appear that apathy hit me again ! 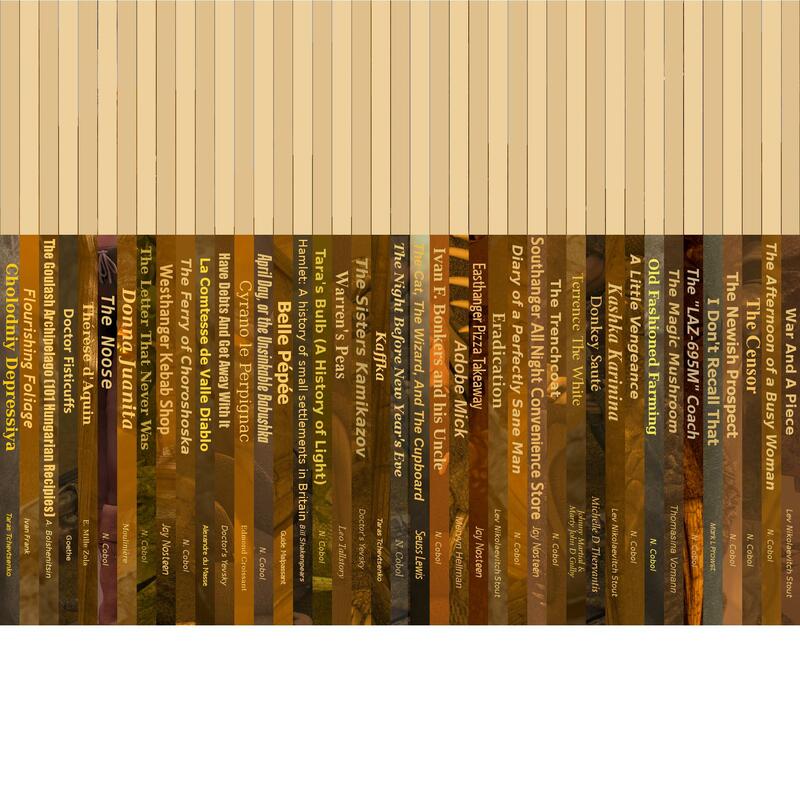 In the unlikely event that anybody wants to change some of the titles on the 41 book prop, here are the spine backgrounds and text as separate PNG files. Import into GIMP or whatever as layers (one titles layer over one spine colours layer) and fiddle to your dear little heart's desire ! It is looking great Pete!! Can not wait to see the finished product! This Poser prop is a TEST PROP for anybody who wishes to try it out and provide feedback. Please read the part around this post on the associated SM thread for more details - it's basically the most complex and high-poly (88 vertices, 86 faces - ha! ha! ha!) 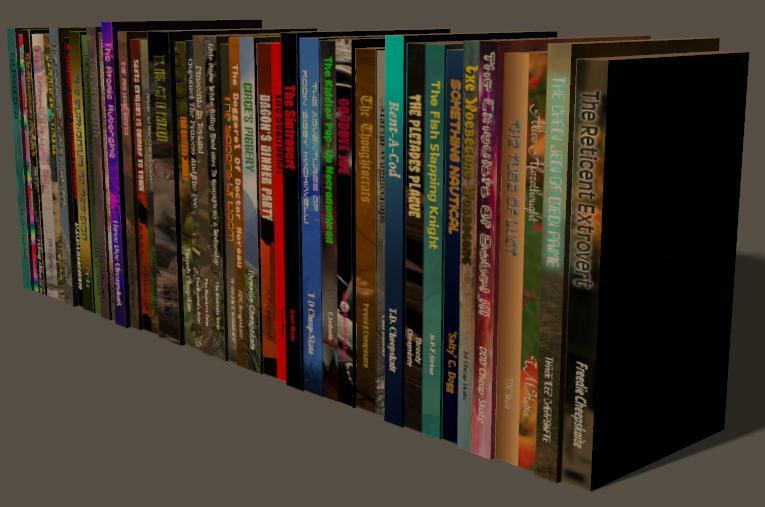 of the five base book meshes that I'm going to use for the reworked bookrow/stack prop, and has about half a dozen simple morphs. The attached ZIP contains just one file, a Poser prop file - '07HBC+Gx1.pp2' (07HBC+Gx1 is my abbreviation for Blender file 07, HardBack, Curved spine, plus Gutter, single book). 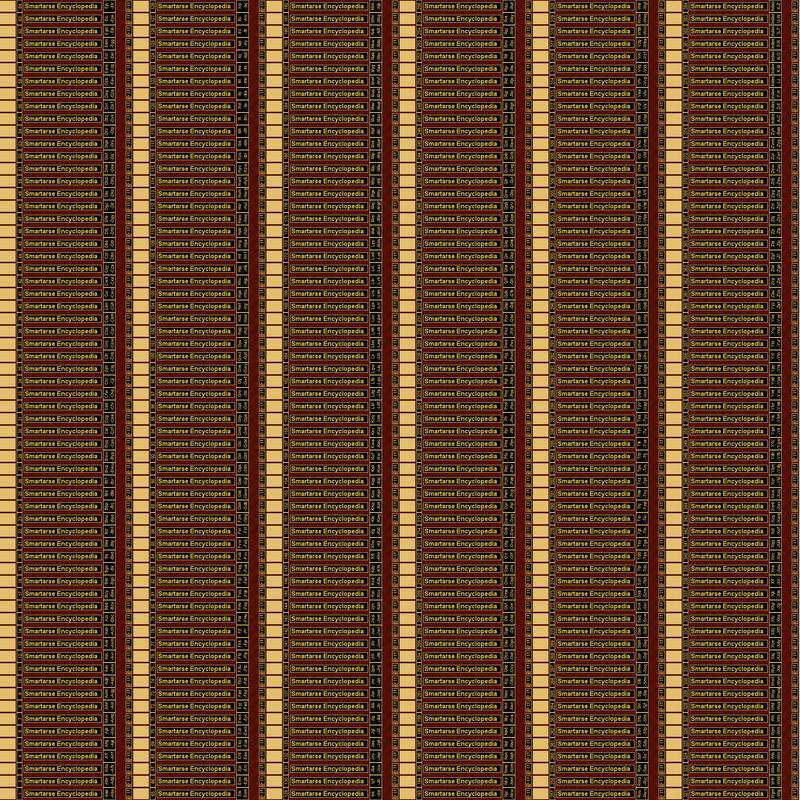 It will ask for a texture file (not included in the zip or this post) when you load it (that's available on the SM thread - maybe I'll add it to this post in a moment... edit: it's actually the texture attached to the previous post here.). If you do play with it I'd be pleased to hear any feedback - if you think it's c**p then tell me so, but tell me why it's c**p ! 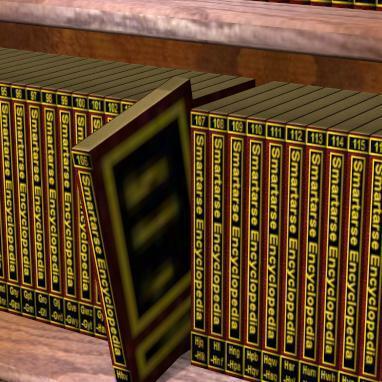 The original 41-book BookRow prop also had some morphs for allowing it to be used as a stack of books. 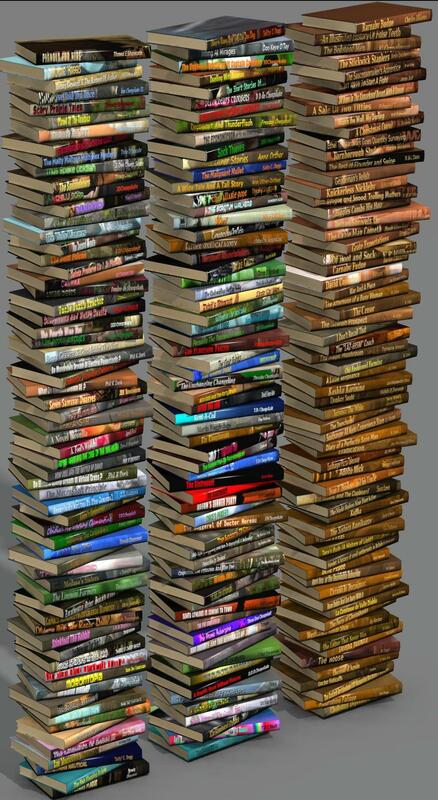 I intentionally did not include those morphs in the replacement, as I have other plans regarding stacks of books. One of the options I've been playing with is loading multiple single book props and parenting the second, third, etc to the first. Then creating dials in the first book that will control morphs, rotations,etc in all the other books. 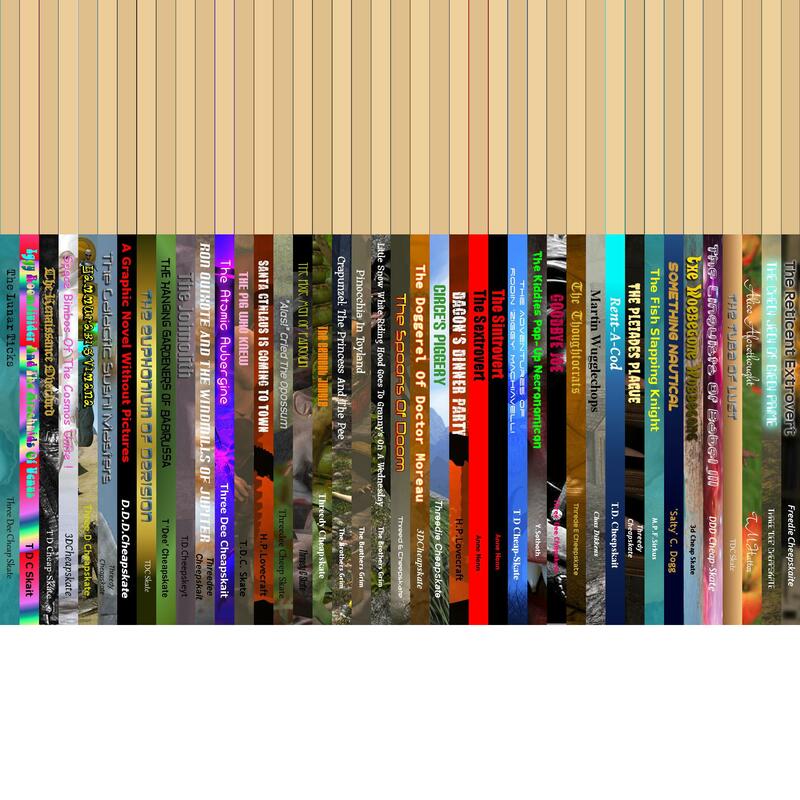 But the first step is to get each individual book to use a different V_Offset into the image map. (Remember here that I'm using Poser to develop this). 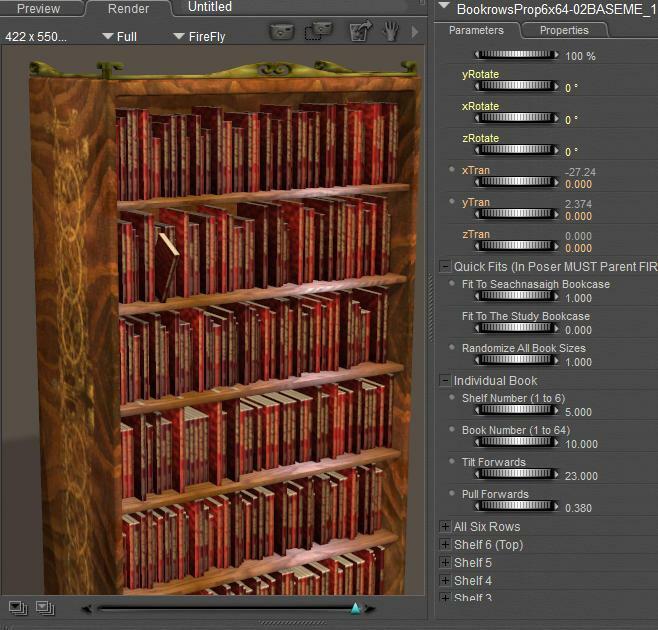 I thought I had that sorted - using multiple single-book props, using a master dial on the first book to define a global V_Offset into the texture map, individual (slaved) dials on each book to define individual offsets from the global one, and Parmatic to update the actual V_Offset values in the Image_Map material nodes. There is a 'BookOffset_0_to_32' dial in the parameter tab of book 1 only (07HB+Jx01_1) to which all four books' PM:BOOK_0_TO_31 dials are slaved with a deltaAddDelta value of 1. A picture speaks a thousand words, so here's a picture. Annotated with some extra words of explanation. In PP2014 I change 'BookOffset_0_to_32' from 0 to 10. The PM:BOOK_0_TO_31 dials in the parameter tabs of all four books change correctly. First book selected, run Parmatic Updater, render... big surprise, it's exactly as before! Weird. Go to the Material Room - PM:BOOK_0_TO_31 shows as 10,the correct value for the first book. Go back to the Pose Room and render - the first book is now correct. 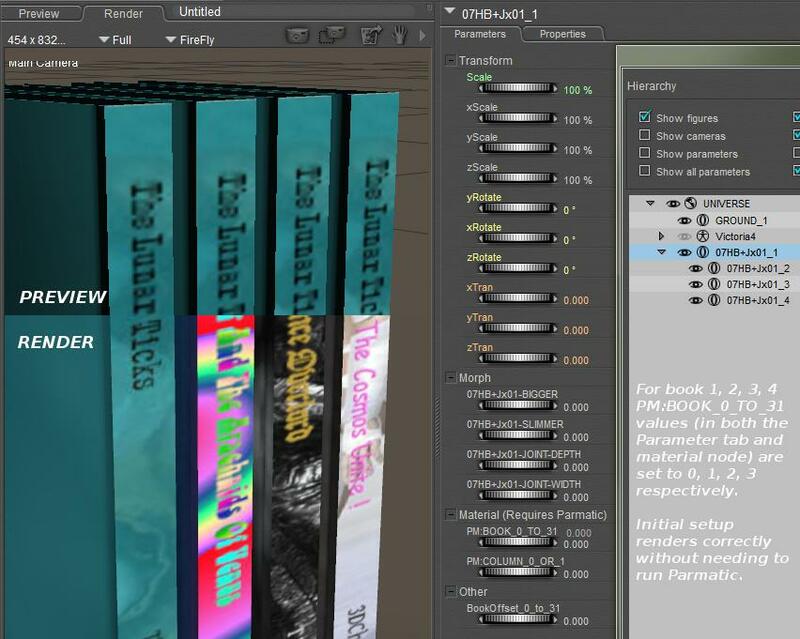 Select the fourth book, go to the material room, value is 13 which is correct, go back to the Pose Room, rerender- fourth book is now correct too. 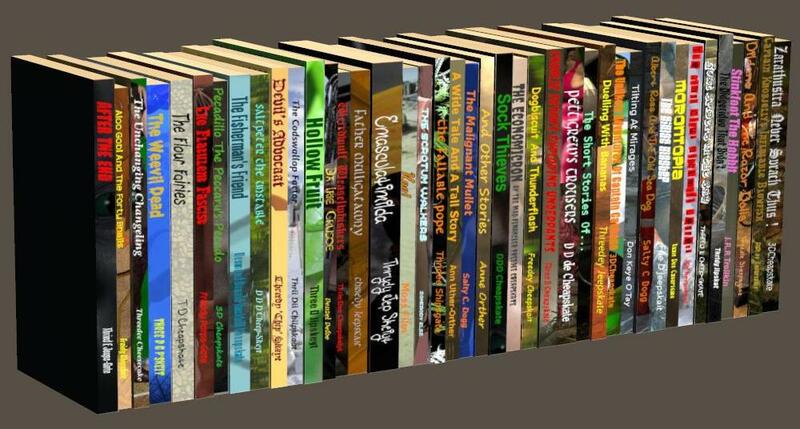 If I try to be clever and go back into the material room with the fourth book selected,and in the material room select the third book and then the second book I see that they both still have the wrong (i.e. the old) values, but when I return to the Pose Room and rerender one of them is now correct.